Welcome to Troop 76's public website. We are Simsbury's oldest Boy Scouts of America (BSA) troop, celebrating 90 years in 2011, and are proud to be winners of the "Honor Troop" award for the best overall program in the District, and the "Golden Tent Peg" for offering the most nights camping. Troop 76 is based in Simsbury, Connecticut at the First Church of Christ on the corner of West St. and Hopmeadow St. We meet every Thursday during the school year from 7:00 - 8:30PM. Our troop ranges between 80 and 100 scouts which are broken up into several scout led patrols. We offer at least one camp out each month, plus campouts tailored for older Venture scouts, and a strong High Adventure program. Scouts plan our activities under the guidance of the troop Senior Patrol, Ventures, and experienced, active adult leadership. Troop 76 does all internal communication to troop members using google groups. You can access the google group by clicking on this link. Please note, you must have been invited to join the group and be logged into your google account in order to gain access. Please contact Marilyn Havighorst <troop76comm@gmail.com> or goto the contact us section to request access. Troop 76 stores all of its documents in the google documents cloud. You can gain access to the documents repository by clicking here. As with the group, you must be logged into your google account in order gain access. 1. Lots of great company – 19 adults! T76 Adventure on the high seas! Troop 76 now has a group of experienced sailors in its ranks! 10. 81 people on the trip (54 boys/27 adults) all 7 Patrol leaders too! - a new record? 9. New skits at the campfire - 3 from Chris Anderson's patrol alone. 8. Jambalaya for the adult dinner - thanks Mr. Goldsmith. 7. "Not such a bad hill" - Mr. Anderson. 6. Howe Cavern was cool, especially the boat ride. 5. Mr. Lungarini squeezes into Clarksville cave. Mr. Melvin yells, "MAN PLUGS HOLE"! 3. Mr. Melvin somehow slides into the crazy tight underground waterfall right after Mr. Millett (50 feet underground). 1. Seeing blue sky, the sun and the Ballard's with hot soup and hot cocoa after escaping the cave! As they do every year, Ventures went up to Camp Moses Friday night for a pizza dinner and to plan and rehearse their program. Surprisingly, they were lights out by 10:30. With the flu going around there was some doubt, but once again it was a great turnout for Troop 76, with a total of nearly 60 Scouts, Webelos/Parents, Ventures and Adults attending. Jack Polizzi did a great job leading the event in place of John D-B, who was away for most of the weekend at a sports event. As always, the Ventures planned and organized the entire MI program, but thank you to all the Adults who helped out by transporting Scouts and equipment and bringing food…lots and lots of food. Speaking of food, Chris Anderson planned and executed (with his team) the meals for Scouts, Ventures and Webelos. His Dutch Oven meals were delicious, making them worth the wait. Speaking of food again, Mr Lungarini cooked for the Adults. His Chili Lungarini was excellent. Did I say there was lots and lots of food? Following last year’s 2 degree overnight temperature, this year’s 32 overnight temperatures seemed balmy. After watching Will Oliver and Connor Barnett construct a quinzhee (a type of snow cave) a group of Scouts decided to try their hand. Mr Carr and others strength tested them both by jumping up and down on the roof. They weren’t being mean, just being sure the quinzhees were safe. The Scouts’ cave didn’t survive, but the boys said it was now a great snow fort. Fittingly, at the end of their performance there was a major spontaneous snowball fight, with Scouts attacking the Adult Patrol with repeated volleys, flanking moves, skirmishes and other military maneuvers. After about a half hour, both sides retired to plan another engagement. Troop 125 from Granby was also at Moses for the weekend and we invited them to share our campfire and Cracker Barrel. It was a huge success, with both Troops enjoying Scout camaraderie and learning new skits. There can be no doubt the biggest crowd-pleaser was our Venture’s “Falling Rock.” In fact, Richard Boyer’s portrayal of Falling Rock was a crashing success. 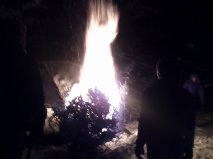 Later, the Ventures had their annual Christmas Tree Bonfire. There’s no doubt that this year’s effort could be seen by any satellites that happened to be flying by at the time. Finally, a number of Scouts and Adults learned Cribbage over the weekend, so there may be new challengers for the Cribbage Tournament on the Ski Trip in March. Thanks again to the effort put in by both Scouts and Adults. December Shoot-r-ee Campout Was a Blast! Troop 76 braved the threat of early December rain for a fun and outstanding weekend of all kinds of shooting. We spent the weekend at Camp Mattatuck in the old Baden-Powell campsite, under the excellent leadership of Richard (scout planner) and Cole (SPL for the weekend). Scouts competed in one of biggest off-season shooting events the camp has seen, with rifles, shotguns, muzzle loaders, bows and arrows, atlatls, and tomahawks. Ward was high scorer for the day: first in Archery by a point and tied for first on the rifle range. Dylan and Richard waking up with a river running through their tent, but bouncing back to dry everything Saturday (Thanks to the 9 foot fire ring the adults built). Very proud of them for sticking it out the whole weekend. Building a brand new campfire amphitheater to help reclaim the old campsite (the first of many visits to come). Mr. Starrett's and Mr. Weiland's amazing wild boar and venison stews and potatoes roasted over the open fire, capped off by chocolate raisin bread pudding in the dutch oven... all with enough left over for the scouts to sample! Thanks to all the adults who came for the day and stayed for overnight. Special thanks to those who volunteered their time to supervise the events and keep the scouts safe: Mr. Hatch, Mr. Mundt, Mr. Hsu, Mr. Johns and Mr. Starrett. We could not have pulled off an event of this scale without all the adult participation and expertise, or without the boys' leadership, independence, and respect for each other. On Sunday, November 11, Troop 76 again took pride in attending Simsbury's Veterans Day ceremony to honor those who have served our country. Scouts turned out strong after a weekend of Searching and Rescuing. It was great to see troop alum Colby Esthus there. Colby was on assignment with the National Guard in Afghanistan when his vehicle hit a roadside IED. Colby was severely injured, and has made an excellent recovery. Simsbury's veterans, through the VFW and American Legion, support us strongly at our Eagle Courts of Honor, it's the least we can do to return the favor and recognize their sacrifice and service. Veteran's Day weekend, Troop 76 became one of the first troops in the country to work on the new Search and Rescue merit badge. Mark G. and Ryan C. planned a day of SAR activities in People's State Forest, including card searches, line searches, and searches for Roderick the Gnome and two "missing" scouts. The last search took on a little added urgency when we found surly hunters in the same area where the scouts were "lost". We couldn't have pulled off the weekend without the expert guidance of Deb Monde from Farmington. Ms. Monde and her two SAR dogs taught the skills, and her demonstration of how SAR dogs know how to work was amazing. On the morning of November 6, the Community Farm of Simsbury hosted a "thank you" breakfast for Troop 76. Over the past year, our scouts served food and bussed tables at two fundraising dinners, helped at the Farm's fall event, and completed two Eagle projects: Trey P. put a floor in an old shed and converted it to a chicken coop, and Ryan C.built a bridge and walkway over a steam to connect two halves of the property. Farm staff served donuts and apple cider, and cooked up a mean breakfast of eggs, pancakes, and 6 pounds of bacon. We capped off a cool, sunny morning with a photo op on Ryan's bridge and unloading a truck of hay. Thank you, Mark Nolan and Farm staff for a great morning! Windsor’s Northwest Park was an excellent location for this district-wide campout. Open field, many, many trails, the reservoir and lots of woods. Eleven other troops attended. Our Troop 76 scouts proved they knew this skill; older scouts already knew the three skill building sessions and younger scouts Ben C. and Nate B. won the Orienteering award in their division. Adults were surprised to learn from the scouts that cooking macaroni & cheese should begin with cold water and the macaroni mixed in. Then boil it, and they did. This (soupy) method will fill you up so desert is not necessary. Well, later the dutch oven chocolate cake did disappear! Breakfast is also best if you get right into the pancake batter. Some wore enough batter to earn a Batter Merit Badge. No one went home hungry, sleepy yes but not hungry. Scouts and adults alike will remember the events and camaraderie of the 60° day and the autumn full moon night! Thanks to Mr. Royce for organizing the adults, and Paul R. for an excellent job leading the troop as SPL for the weekend. 41 Scouts and parents canoed all day Saturday and Sunday morning, camping by the river at Hurd State Park. It was great to see so many new Scouts and their parents. 10. Canoed 2 rivers: The Mattabesset and the Connecticut. 9. 15 miles in two days! 8. Where's the rain, pass the sunscreen. 7. Patrick Sullivan uses very little sunscreen, enters a lobster look-a-like contest, and wins! 6. Mr. Carr's pirate costume. 5. Ryan Casalino hops in a kayak, does great, and then capsizes in sight of the take-out point. 4. Who had a better time than Ryan Casalino? Nobody! 3. Michael Rattray leads his first patrol on a campout. Nice job Michael, but hotdogs for dinner? 2. Mr. Cary's great adult dinner: Stew, Mr Oliver's wild turkey, salad and Mr. Carr's wicked good apple cobbler. 1. Watching the adults suffer on "Heartbreak Hill". No snow in Simsbury? Just head north to Camp Moses for our annual Mission Impossible campout. We all recognize that when it comes to adhering to Scouting principles and having a good time, Troop 76 stands among the best…but when it comes to winter camping, our Scouts kick it up another notch. Knowing that they'd be camping out in temperatures near 0° was no deterrent to our Troop. All told, 45 Scouts, Ventures, and 7T6 adults attended this year’s MI. As testimony to our “be prepared” confidence, in addition to a handful of first time Blue Nose campers (18° or lower), more than 30 were Blue Nose Repeaters! Now, that’s impressive. But it’s not all. 30 Webelos and Webelos parents also joined the campout and activities…but staying overnight in the lodge, as Webelos are not allowed to stay outside when the temperature drops below 40°. (For that, our popular annual September Farmington River canoe/kayak/water sports trip is THE event to attend.) Rigby and Justin did a great job leading the two Webelos Patrols. “Cowboys and Aliens” was the theme the Ventures picked this year (led by Ryan and Nate). The storyline didn't even loosely follow the movie. Patrols went out on the trail locating skill stations set up and run by our Venture Scouts. At each station, they collected pieces of a map that, when put together, directed them to the location of the Final Battle to Save Earth and rescue Connor, the Troop’s kidnapped Senior Patrol Leader. After supper and a campfire of songs, skits and jokes, the Webelos capped off the night by making neckerchief slides with the troop branding irons. Of course, Mission Impossible wouldn’t be complete if the Ventures didn’t burn a Christmas Tree or two. Thanks to our fellow scouts at Troop 174, whose Christmas trees make the blaze possible. We strongly recommend their high quality product. Thanks to all…Scouts, Ventures and Adults…who worked to make the camping trip a success. 10. Mr. Starrett's excellent lamb stew for the adult dinner and great campfires fueled by Mr. Anderson's wood. 9. Outstanding adult help and participation. 8. Venture patrol located all 15 markers on the orienteering course in under 2 hours. 7. Cole, Dylan, and Ryan setting out the course punches by bike on Saturday morning. 6. Full moon bike ride around White Memorial for the Friday night Ventures. 4. Our first "Blue Nose" of the year (18° Saturday night). 7 Scouts and 6 adults earned the award. 3. A full moon so bright you could see your shadow at night. 2. Perfect sunny weather during the day. 1. Stargazing through White Memorial's gigantic telescope to cap off Saturday night. After setting up camp and some orienteering instruction, outstanding sunny weather made for a great day in the woods as Scouts competed on the White Memorial Foundation orienteering course. Three patrols headed out at timed intervals followed by the Ventures and then the adults. The Scouts had a great time although some of the markers eluded them. The Ventures turned in the best time finding all 15 markers in less than two hours. The adults found all 15 markers without serious injury, although several complaints about creaking joints were overheard. Special thanks to the Ventures that set out the punches and patrolled the orienteering course on mountain bikes during the event. As darkness fell, Scouts cleaned up from their evening meals and then pulled together an impromptu game of capture the flag. The full moon was rising as we meet representatives from the Litchfield Hills Amateur Astronomy Club at their observatory in Sawyer Field. The club's 17 inch reflector telescope, as well at two other high-end telescopes brought by club members, were open for gazing at the night sky. Besides viewing the craters and mountains of the full moon and several stars, Scouts were treated to an outstanding view of the planet Jupiter, with its colored bands and four of its moons clearly visible. Careful monitoring of the temperature as dawn approached on Sunday morning revealed a low temperature of 18.3 degrees at our campsite along the Bantam River. Consultation with on-line sources confirmed a low of 18. Seven Scouts and six adults earned the Blue Nose award. Good preparation and proper equipment was clearly evident as the Scouts handled the cold weather without any significant issues. Overcoming the temptation to just hang out by the warm fire, Scouts packed their gear and cooked breakfast in near record time, allowing us to leave camp and get on the road for the return to Simsbury before 9:00 AM. 10. Friday night 8 Ventures hiked in the moonlight to the Paradise camp-site. 9. Great weather, snow Friday, but up to 50 degrees and sunny on Saturday. 8. Guy Weiland and Ben Cary knocked off their first backpacking trip with the Troop! 7. Perfect Saturday morning hook-up with the Troop and Ventures at Sages Ravine. 6. Hiking the ridge line, checking out the 800 foot vertical drop. 5. Cole Starrett tries to make a fire. 3. Bow saws really work! 1. Ventures take a crazy picture at the Summit! Check out the pictures to the right, they're cool. Troop 76 Campers got a shot of winter when they should have been getting a shot of fall foliage colors in late October when a freak October snowstorm dumped well over a foot of heavy snow overnight. The storm created wild scale power outages in Connecticut and surrounding areas. Troop 76 campers weathered the storm in West Point, NY while on a campout there. This is one of those times when the scout motto ' Be Prepared' has special significance! This Columbus Day weekend, Troop 76 traveled to the eastern Adirondacks to retrace some of Simsbury's contributions to the American Revolution. We kicked off the weekend with a hike through Saratoga National Historic Park. On this weekend 234 years ago, men from Simsbury joined militia from around New England and New York to defeat the British in one of the pivotal American victories of the war. It was after this win that the French became convinced the Americans could win, so joined with us. Highlights included the a visit with British reenactors, a musket demonstration, and lowering the park's flag at the end of the day. Dan and Chris added another mile to the 4-mile loop to knock off their 5-mile hike requirement for Second Class. Cole and Sean provided expert leadership, and scouts cooked and camped that night on the shores of Lake George under a full moon and perfect weather. Sunday started with a walk along the edge of the hundred foot sandstone cliffs at AuSable Chasm and a raft ride over a 16 foot whitewater drop in the narrow canyon. The troop toured Fort Ticonderoga later that afternoon. Simsbury's own Noah Phelps spied on the British at the fort and collected key information that let the Americans win again and send the fort's 78 cannons to Boston, where George Washington used them to also capture that city. Ghost stories, skits, and songs around the campfire followed another excellent dinner. Before heading home Monday, the troop drove to the top of Mt. Defiance to get an aerial view of Fort Ticonderoga and Lake Champlain. We took the ferry across the lake for lunch at one last historic monument -- an old fashioned A&W with curbside service in Middlebury, Vermont. It capped off a great trip that got scouts home in time for dinner. Thanks to Mr. Hsu, Mrs. Regenauer, Mr. Mundt, and Mr. Oliver for great company and solid adult support. The troop family campout this year was in Newport. According to Mr Starrett, a great time was had by all. Here's his top ten for the campout. - 2:  Ventures camping on the Narrow River beach. - 1: Sailing on the Madeleine! The boys had a great time crabbing! Last Regular Troop Meeting for 2010/11: Water Polo! The troop held its last regular troop meeting outdoors in the water at Stratton Brook State Park, one day after out official 90th anniversary (the troop was chartered June 1, 1921). Cake and ice cream capped off the night. 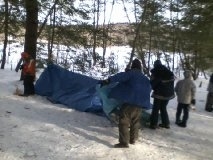 OA Ordeal this weekend, Advenure Race, Relay for Life, and Family Campout at the end of the month. What a great way to tie up the year! The May campout included a 50 mile bike ride from New Haven to Simsbury, combined with a 10 mile biking scavenger hunt around Simsbury for younger scouts. Non-bikers and Cub Scouts enjoyed a day of activities at the Simsbury Community Farm, including tomahawk throwing and a 90 foot monkey bridge spanning the farm's streams. The evening campfire could be seen for miles and provided light for any late-night landings at nearby Simsbury Airport. The bike tour kicked off a fundraiser for the Sgt. Felix DelGreco Memorial Scholarship Fund. Felix was an Eagle Scout from the troop who was killed in Iraq in 2004. You can find more information about Felix and the scholarship in the links on the left column of this site. Additional information and a display of prizes from the raffle portion of the scholarship fundraiser are available at Fitzgerald's Food in downtown Simsbury through the end of May. Thanks to the National Guard and the Masons for their support of the long bike ride, Mr. Holowesko for planning the events, and Harley Heath for his field leadership of the scavenger hunt. The troop spent the perfect spring weekend of April 8-10 at Camp Mattatuck. Scouts competed in six scout skills stations, including tomahawk throwing, climbing, first aid, Paul Bunyan (knots & lashings, regular and "extreme" versions), signaling, and shelter building. It was great to have some many new scouts and their parents -- an excellent introduction to our home for summer camp. The boys cooked dinner and breakfast by patrol over open fires and ate well (Doritos tacos, sausage and pasta, eggs and bacon, and several other cuisinary delicacies). The weather was perfect (as promised). As a result, the Capture the Flag battle lasted until 9:30, followed by great skits around a roaring campfire. Everyone slept well under a clear sky, and in the morning pitched in to make sure the site was cleaner than before we arrived. The adults, after competing in their own Olympiad (courtesy of the always entertaining Dr. Depasquale), feasted on venison stew, pulled beef sandwiches, sauteed vegetables, and fresh baked bread and chocolate cake, all hot from the open fires and Dutch ovens. Thanks to James Depasquale for some incredible planning, the Ventures for running the stations, and Mr. Greiten and Mr. Starrett for the behind the scenes logistics. 26 scouts braved the cold wet weather over the December 12th weekend with just the basics - No tents, no patrol boxes, no lighters, no stoves. Wow! Our scouts backpacked two days on the Appalachian Trial in Kent, CT at the end of October. The trip included a full moon hike in on Friday night for Ventures (picture at right) and a descent through St. John's Ledges on Saturday. Weather was perfect and the scenery was great. Scouts carried all their gear, including tents, sleeping bags, food and water, stoves, and clothes, for the entire hike. We set up camp along the Housatonic river at one of our best campsites ever. After an afternoon of relaxing and games, the scouts cooked their own dinners and had a roaring campfire. A challenging hike for our newer scouts, and excellent leadership experience for the Patrol Leaders and senior scouts. Thanks to Mr. Sullivan, Mrs. Berkner, Mr. Melvin, Mr. Michaelson, and Mr. Starrett for helping out. On to Mt. Monadnock! Scouts recently spent two nights aboard the USS New Jersey over Columbus Day weekend. Scouts also toured Ellis Island, the Statue of Liberty, the Liberty Bell, Betsy Ross' House, Franklin Court, Elfreth's Alley, and Ground Zero along with many other historical sites. Scouts hosted the webelos for a canoe trip down the Farmington River for our September camp out. Water was very low but beautiful weather and a cache of squirt guns made for a memorable event. NOTE: To download the Troop 76 handbook in PDF format, please click on the download 'arrow' on the right hand side of the bar.